Professional singer with more than 30 years experience providing entertainment for parties, country clubs, social clubs, reunions, corporate functions, car shows and oldies concerts for over 10,000 people. So far I have entertained over 4,000,000 people and counting. I offer professional services as a singer, disc jockey, karaoke host and master of ceremonies throughout Central, Western and South West Florida. Specializing in entertainment targeting the Baby Boomer Generation at Country Clubs, Milestone Birthdays and Anniversaries, Reunions and more. 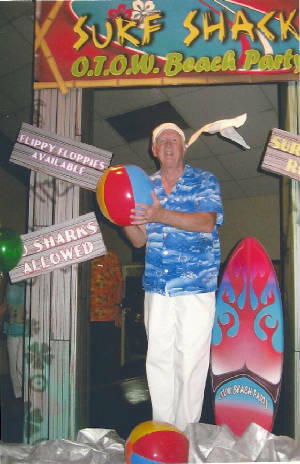 Themed events like Sock Hops, Disco Parties, Hawaiian and Beach Parties, Holiday celebrations just to name a few. Review the "References" section at the top of this "Home Page" for these type of events and feedback. Be sure to click on the "Music Database" at the bottom of this page. The songs are just a sample of what I have to offer as a DJ and it is a valuable tool to choose your music for any event. Please note the Top 200 requested songs as well as the top 100 selections broken down by each decade. I am a Vietnam Era Veteran and offer a military discount for Veterans. You can also view a sample of hundreds of songs that I sing by clicking on the "Singer" tab. For more information about what I have to offer, contact me at 352-799-7636 or email at DJFred@FredCampbellEntertainment.com. Parties start at just $250.00. Certain restrictions apply. I perform in NON SMOKING facilities only, no exceptions. Discount for Military Personnel & my fellow Veterans, please call for details. I am a professional singer who can sing many genres including Tropical Rock, Classic Rock, Standards, Doo Wop, Feel Good 50's and 60', Soft Rock, Rhythm & Blues/Soul/Motown, Country and many other styles. (See some specific artists listed below) Click on "SINGER" at top of this HOME page to see a sample of hundreds of songs that I sing. For the baby boomer generation, there is a special emphasis on the songs from the 1950's through the 1970's, if requested. I also offer the "Fred Campbell Old Time Rock & Roll Revue," where I sing hundreds of songs from the 1950's to the 1970's. When applicable, I not only sing the songs, but I also give a history about some of the song writers and artists who sang those songs, as well as certain facts about the songs. Among a sample of artists whose songs I sing are Elvis, the Everly Brothers, Buddy Holly, the Eagles, the Beach Boys, BTO, Bob Seger, Jimmy Buffett, Oak Ridge Boys, Hank Williams, Temptations, Doo-Wop groups like the Crests, Five Satins, Duprees, Dion & the Belmonts, Spaniels, Del Vikings. If you would like to hear me sing Daddy's Home with some of the original Bob Shoo Bops, go to the BIOGRAPHY tab and click on "Bob Shoo Bops sing Daddy's Home". For more information, please contact me in Brooksville, FL at 352-799-7636 or DJFRED@FredCampbellEntertainment.com. Since moving to Brooksville, Florida in late 2003, I appear quite often at On Top Of The World in Ocala, FL, which is rated as one on the best retirement communities in the USA. I sing and DJ for several events in The Villages, Lady Lake, Florida. I have also performed twice at the Brooksville Bandshell Bash! concerts, Doo-Wop and Beach Party Themes. At the Doo-Wop Concert, I was on the billing with the Crests again, this time with lead singer, Tommy Mara. Both concerts were estimated at over 1000 in attendance. I have sung at many of the retirement communities in Central Florida, such as Heritage Pines Country Club in Hudson, Wellington Country Club and Timber Pines Country Club in Spring Hill, Glen Lakes in Weeki Wachee, Tampa Bay Golf and Country Club, Silverthorn Golf and Country Club, Sun City Center, Brookridge and Clover Leaf as well as the FMCA at the Hernando County Airport. I have also donated my services to the Greater Hernando County Chamber of Commerce, Relay for Life and other great causes. Let me give your event a special touch by singing some of the more than 1,000 songs in my personal catalog of music from the 1950's to the 1980's. Many of the songs that I sing are included in the TOP 200 as compiled by online requests made by thousands of clients. If you have a need for a professional singer, disc jockey and master of ceremonies, please call me at 352-799-7636. Servicing the West Coast and Central areas of Florida from Gainesville, Ocala, Orlando, Tampa, St. Petersburg, Clearwater and Sarasota.